I love a good post apocalypse novel, even though I am totally afraid of a massive disaster, like a plague, or meteor, or worldwide economic meltdown. This is why reading these types of novels is fun for me. Severance was actually a plague based disaster novel, with a little bit of cult obsession and passive zombies added in to keep things interesting. The novel focuses on Candace, a disillusioned New Yorker who somehow manages to survive the “fever” that swept across the globe. We switch back and forth between Candace’s life right before the fever when she had a mid-level publishing job, and directly after the fever when she is traveling across the country with an interesting group of survivors. Throughout the book it is clear that Candace has secrets, and we want to know them all. I enjoyed reading this book. I expected a post-apocalyptic zombie novel, but I got something different. At times the novel was more of a commentary on our consumeristic, productivity-driven society, and how none of that means anything in the end. The book reminded me of Station Eleven by Emily St. John Mandel, one of my all time favorite books. However, the more I think about this book, the more I realize I probably won’t remember it in a few months from now. Severance is a quick read with some interesting ideas, but not something I would tell my friends to rush out and read asap. 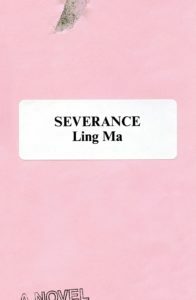 Share the post "A Severance Package at the End of the World"